Let’s face it, some people don’t even think about this question. 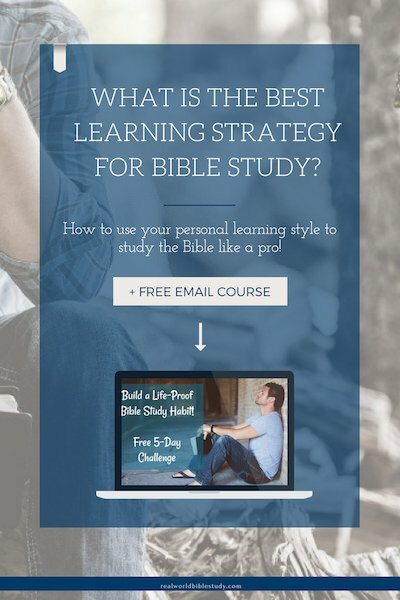 Learning strategy for Bible study? 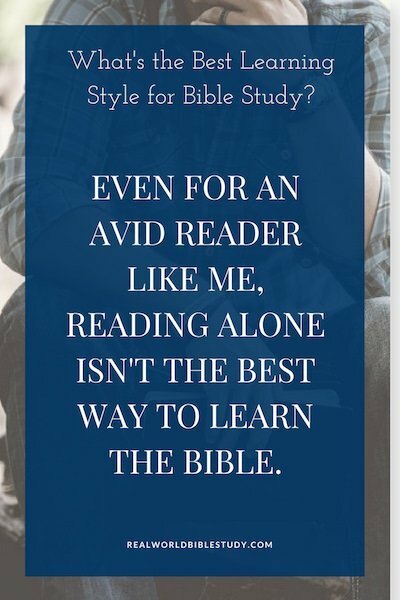 You either do Bible study, or you don’t. There’s only one way to do it, and you’re either good at it or you aren’t. Right? If you’re having trouble with Bible study (or even with the idea of Bible study…everyone struggles with it sometimes! ), you need a good learning strategy. And…I’ve got one for you! It won’t be exactly the same for each person, but the keys below will help you create your own personal learning strategy for Bible study. By the way, you can also use them for anything else you have to learn! You will probably hear me say this a lot. When you first start working out at the gym, you don’t pick the heaviest weights on the rack. It’s a good way to get injured or get discouraged and give up. Instead, you pick a small weight: just big enough that it will challenge you after many reps. Gradually you will increase the weights as you get stronger and build muscle. The same goes for Bible study. When you want to start a good Bible study habit, you need to pick small goals that you can work at every day or several days a week. As you get stronger, you can increase the weight. If you pick something huge, your Bible study habit is likely to go the way of most New Years’ resolutions. You’ll do it for awhile, but get off track and get discouraged, and won’t pick up the habit again. One of the most important learning strategies for Bible study is to get lots of practice so that you get better, and if you fall off the wagon on week 2 you aren’t going to get that practice. 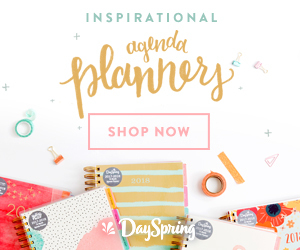 If you want to know more about how to build a life-proof Bible study habit, check out my free 5-day challenge called…Build a Life-Proof Bible Study Habit! (deep, I know). Glasser’s observation has shaped how I teach, and it should shape your learning strategy for Bible study too. When we think of Bible study, most of us think of books and reading, because, well, the Bible is a book. I love books, and the written word is a powerful way to transmit knowledge and check for accuracy. But even for an avid reader like me, reading alone isn’t the best way to learn. We might start with reading, but we need to incorporate some of these other methods into our learning strategy for it to be truly effective. I don’t know about you, but I don’t want to learn 10 or 20 or even 50% of what God has for me. In school that wouldn’t even be a passing grade! I want to be in that 70-95% range! What does this mean for our learning strategy for Bible study? 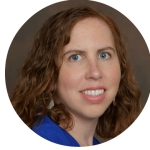 First, use audio methods to double your impact. If we learn 10% of what we read but 20% of what we hear, we just got double for our money. You can listen to many Bible translations for free on the Youversion app. For a more dramatized reading (think sound effects and actors rather than one person reading), check out The Bible Experience recordings. Second, get interactive. Join a small group Bible study to discuss what you’re reading (70%), reflect on your own experiences of that Bible idea (80%) or teach it to someone else (95%). (This is why I teach, by the way.) Teaching doesn’t have to mean formally teaching a class. It could mean telling your kids or your friends, sharing what you learned in a blog post or on Facebook Live. For those of you who are college or seminary students, writing a paper is in this category too. If you’re actively participating in your small group Bible study, and showing up prepared, you’re probably doing some teaching there too. But start to think about how you can make sure you are actively discussing, experiencing, and teaching what you learn in Bible study. Learning Strategy Part 3: Know how YOU learn. The Glasser quote above discussed how we (humans) learn, but there is also a special way that you learn in particular. A good learning strategy for Bible study is geared towards YOU, so take time to figure out your learning style(s). Are you a visual/spatial learner? Aural (sound/music)? Verbal (words – spoken or written)? Kinesthetic (Tactile – Hands-On)? Logical? Many of us are strongest in 1-2 areas. If you don’t know your learning style, you can take a look at this great Learning Styles infographic from Blue Mango Learning, or take a learning style quiz online. Once you know your learning style, explore different ways you can do Bible study with that learning style. There are some great blog posts out there on adapting your study techniques to your learning style; these can be applied to Bible study too, not just the traditional school classroom. Aural (audio) Learners: Use an audio Bible or read out loud, use songs to memorize Scripture. Check out more ways to do Bible study for auditory learners here. 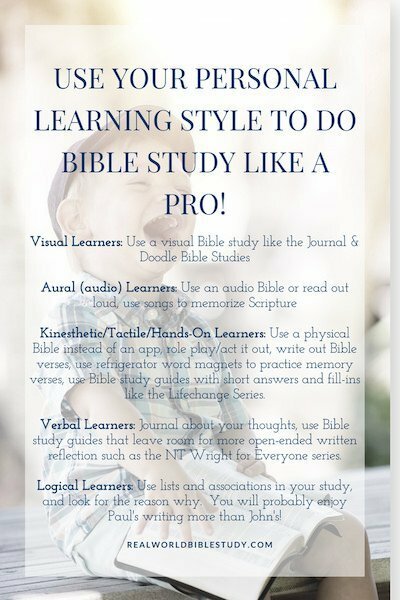 Kinesthetic/Tactile/Hands-On Learners: Use a physical Bible instead of an app, role play/act it out, write out Bible verses, use refrigerator word magnets to practice memory verses, use Bible study guides with short answers and fill-ins like the Lifechange Series. Verbal Learners: Most Bible studies are already catered to you. Journal about your thoughts, use Bible study guides that leave room for more open-ended written reflection such as the NT Wright for Everyone series. Logical: Use lists and associations in your study, and look for the reason why. You will probably enjoy Paul’s writing more than John’s! 80% of the world’s humans are what we call “oral preference learners.” This is not about whether you can read. It’s about how you learn and how you think. Most of us learn by something we can relate to (story) rather than by abstract thought (bullet point list). 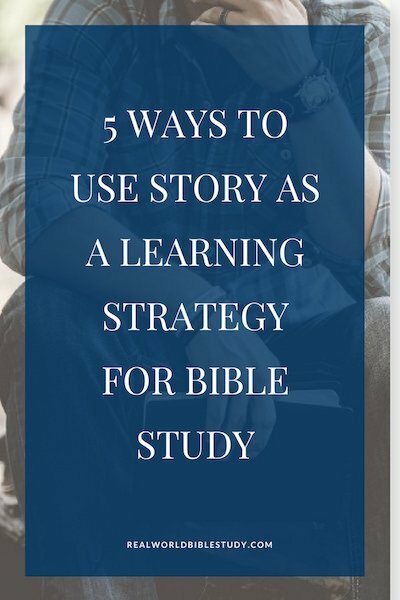 How do you use story as a learning strategy for Bible study? read Bible stories and try to re-tell them to yourself or someone else. Think about how you relate to the people in the story. Storytelling is a great tool for Bible study. When you read parts of the Bible that aren’t story-style, think about where they fit in God’s big story. Also, consider what story is behind the need for this piece of writing (law, letter, poetry etc.). Use your own testimony, the story of what God has done in your life, to connect to Bible concepts. Compare and contrast existing stories in your culture and think about how they connect to ideas from the Bible. Actually, you can even use fiction from our culture – Christian fiction and secular fiction – to interact with the Bible and God’s story. Read more about why Christians should read fiction here. If you, like me, get super excited about the idea of using storytelling to share God’s word with others, you might want to check out Telling God’s Stories with Power by Paul Koehler or Telling the Gospel Through Story by Christine Dillon. Ok, we’ve covered the four key components that your learning strategy for Bible study needs. Now it’s time for you to put them together. I wouldn’t recommend trying to add everything at once. Instead, pick one area to focus on, and then start building on it over time. Please comment below! What are your top 1-2 learning styles? Which part of this learning strategy for Bible study will you focus on first?